American artist Robert Charles Dunahay was born in the United States. He currently lives and works in Palm Springs, California. Dunahay’s contemporary paintings place subjects ranging from palm trees to swaths of luxurious fabric front and center on bold hued backgrounds, elevating them from frequent images in our lives to a symbolic pedestal on the canvas worthy of wonder, confrontation and deeper reflection. His early career was spent in New York City, where he made ends meet through his superior carpentry skills before heading West for the land of sunshine and full time life as a painter. Distinguished patrons worldwide collect Dunahay’s art including the Royal Family Al Thani of Qatar, Baroness Monica Von Neumann of Switzerland and celebrities Pierce Brosnan, Kelsey Grammer and Linda Hamilton. 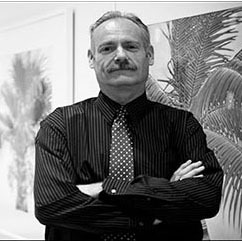 His work is part of the corporate collections for Pepperdine University, The Financial Times, The Packard Foundation and the W Hotel. Dunahay is most known for his Palm Series of paintings depicting grand-scale palm trees in vibrant colors. By depicting his subject in face-to-face portraiture style on a solid background, he replaces traditional references to landscape with the transcendentalism of iconography.